McCall's Air Conditioning & Heating is proud to serve the Avondale community! About Avondale, AZ - Happy to be your hometown Heating & Air Conditioning Contractor! 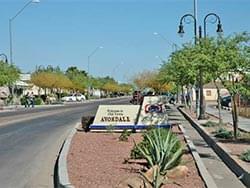 Avondale is a city located in Maricopa County, AZ, and as of 2010 the population was 76,238. It consists of 41.3 square miles of total area, and its technological advancements have resulted in it being named as one of the top digital cities in the country. Students attend one of three high schools: Westview, Agua Fria, and Westview. Avondale is known for a subtropical desert climate that features extremely dry, hot summers and warm winter months. Avondale is home to a variety of attractions that either residents or visitors may enjoy. Racing enthusiasts may enjoy a trip to the Phoenix International Raceway, which is a popular auto racing facility. Movie lovers may enjoy a trip to the Harkins Theatres Gateway Pavilions 18, while golf enthusiasts may enjoy playing a round at the Coldwater Arizona Golf Club or the Valley Golf Center.